Apple and Google: Is Breaking Up Hard to Do? The news this week has been about Google highlighting its improved map service (see Google Pushes Back at Apple, Adds Features to Mobile Maps and Google Holds Its Breath and Tries to Sow Doubt About Apple's Maps) ahead of an official announcement that Apple will be switching to its own mapping service (see Apple's iOS 6 Maps App Nears Completion, Here's What It Will Look Like). Is Google worried about the change? Will Google loose revenue once its maps are dropped from the iPhone? And why does Apple need its own mapping service? I think that all of the blame can be placed on Android. It is like a new girlfriend breaking up a friendship between two buddies who have know each other since grade school. One friend starts spending more time with the girlfriend, and the two guys slowly part ways. Back when Google did search and Apple did computers, they needed each other to offset the dominance of Microsoft. Google improved search, funded Mozilla, and gave away free, web-based software. Apple killed the Zune, made the MacBook a powerhouse, and built Mac OS X into a world-class operating system. Together they offered an alternative to Microsoft that continued to gain strength. Then the iPhone arrived in June 2007, followed by the first Android phone, the HTC Dream, in October 2008. The once close companies were suddenly forced to be competitors in the mobile space - and later in the tablet market. "It's just business" has become their defense for the increasing strife. Features that Google once developed for both Windows and Mac are going to be replaced more and more with features that work first on Chrome and Android. This will strengthen the sales pitch for Android. On top of this favoritism, Google and Apple are now going to face off in court (see Law & Apple: Motorola's Days Are Numbered). This is because Google purchased Motorola for its rich patent pool as a way to bolster Android. Now the puppet, Motorola, will have its string pulled by Google. The battle in court will be about Google defending its choices regarding Android. 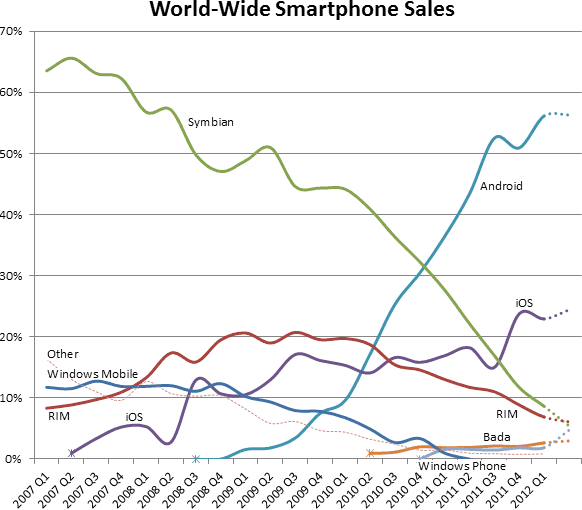 In 2007, Symbian ruled, Windows Mobile was a distant second, and RIM was coming into its own. At the start, I'm sure Apple thought it would be iPhone vs. BlackBerry, which was the #3 mobile platform after Nokia's Symbian and Windows Mobile when the iPhone launched in mid-2007. This would have been a repeat of their teamwork against Microsoft. Google was smart enough to see the value in the iPhone and switched gears to match the better design. RIM's BlackBerry is fading fast, Windows Mobile/Windows Phone now has few takers (falling behind Samsung's Bada operating system), and Symbian is a shadow of its former self thanks to Nokia's decision to switch to Windows Phone. Google was right about who the real competition would be. The question is no longer about the breakup, but why cooperate at all? Apple could turn to Microsoft Bing or Yahoo! Search (currently powered by Microsoft and formerly powered by Google) for search. Either company would offer a sweetheart deal to partner with Apple. Honestly, Apple is too greedy to give up the money it earns from Google's advertising. If either Yahoo or Bing were worth courting, Apple would have sent its lawyers out to make a deal. Money is now the bottom line for Apple and Google. If the money dries up or comes in from another source, expect more separation. At the same time, Google is still a smart company with an endless stream of ideas. Apple cannot walk away from Google completely and risk being totally left out by Google's innovations. Neither can Google walk away from the popular platform that iOS has become. Of the two, I would rate Google as having the most to lose. Apple can always copy Google if Google has a blockbuster idea. Google, on the other hand has great products, but advertising is its real business. If Google get booted completely from Apple products, there are not a lot of places to make up the revenue. I understand why Google hooked up with Android. It want to be in control of its future. I just hope Android was worth it in the end. Apple is a bad company to turn into an enemy.